Get ready to lace up your boots and head out for an adventure! Get ready to lace up your boots and head out for an adventure! We will depart Los Angeles and drive up into the Western Sierra. After approximately a 4-hour van ride we’ll arrive at Kings Canyon National Park, where we will camp for our first night. The next morning we will drive just down the road to the Fox Meadow Trailhead. From here we will review how to effectively pack a backpack and what to expect from the trail. After that, we will hike into the wilderness for three days and two nights with just the packs on our backs. Our first day on the trail will be spent hiking to Jennie Lake, where we will then camp for the night. As you hike along, breathing in the fresh pine-scented air, your guides will teach the group about wilderness topics such as Leave No Trace, naturalism, wildlife, backcountry hygiene, and backcountry cooking. The second day will be spent climbing towards the ridgeline and JO Pass. We will take in views of the ridgeline, Mount Silliman, and Sequoia National Park. After a tough, but rewarding hike, we will camp along the banks of beautiful Weaver Lake. After a second night in the wilderness, we’ll pack up and hike back to Fox Meadow Trailhead, over to the vans, and then drive home. This wilderness trip includes: van transportation, camping fees and wilderness permits, group camping gear (tents, stoves, pots and pans), experienced guides, and all meals--except lunch on the road the first day and dinner on the road on the last day of the trip (bring some money or a card, we’ll stop for something quick along the way). Group gear includes tents, but not your personal ‘sleep system’ (ground pad and sleeping bag) or backpack. 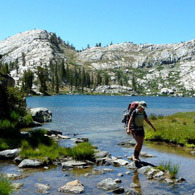 This trip highlights some of the most diverse scenery of the Sierra Nevada Mountains. 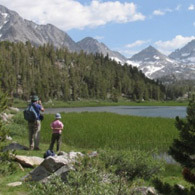 The group will depart Los Angeles and head north toward Mammoth Lakes and the Eastern Sierras. The van ride to our campsites at June Lake is approximately 6 hours long, so sit back and enjoy views of the Mojave Desert and the towering wall of the Eastern Sierra while getting to know your classmates. From our base camp at June Lake, we’ll spend two full days exploring very different aspects of the Eastern Sierra. Nearby Mono Lake is home to remarkable scenic paddling and a vibrant ecosystem. Few people ever get to paddle a kayak past strange tufa formations and abundant waterfowl on the buoyant, saline waters of Mono Lake, but we’ll get to experience this with a local licensed guide. On our other full day in the Sierra, we’ll head out on a mountain trail in search of alpine lakes and views of snowcapped peaks. This all-day hike might test your stamina, but we’ll be prepared to tailor the day to the needs of the group. Trip includes: van transportation, Mono Lake kayak rental, June Lake camping fees, group camping gear (tents, stoves, pots and pans), experienced guides, and all meals--except lunch on the road the first day and dinner on the road on the last day of the trip (bring some money or a card, we’ll stop for something quick along the way). Group gear includes tents, but not your personal ‘sleep system’ (ground pad and sleeping bag). 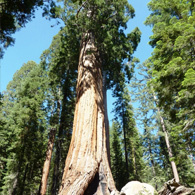 Giant Sequoias, the world's largest trees, grow only in canyons on the southwest side of the Sierra Nevada. Come visit this area with us for four days of camping, hiking, and yoga, good food, good company, fresh air and starry skies. We will camp at the legendary Quaking Aspen Campground, situated next to a lovely meadow with trails leading down into Giant Sequoia National Monument and up to the spectacular Slate Mountain, a classic Sierra peak from which Mt. Whitney can be seen on a clear day. A variety of day-hikes are possible--and relaxation, reading, and yoga in the meadow are great options too! One thing is certain--we'll be sure to visit the Big Trees! This trip includes group gear (tents, stoves, pots and pans), campsites, transportation, experienced guides, and all meals--except lunch on the road the first day and dinner on the road on the last day of the trip (bring some money or a card, we’ll stop for something quick along the way). Group gear includes tents, but not your personal ‘sleep system’ (ground pad and sleeping bag).